The GBRCAA Championships have been held since the associations inception in 1979. Typically a 2 day contest that decides the Associations champion in each schedule. The Mike Birch trophy has been awarded to the FAI Association Champion since 1980 with Ken Binks the inaugural winner and then going onto win a record six times now equal with Matt Hoyland. Kevin Caton is in second place winning 5 times and Kevin has an impressive record of the longest time between his first and last victory of 29 years. A full list of the winners for all schedules can be seen in the GBRCAA Results Archive. 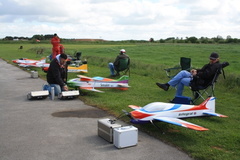 The GBRCAA Championships are the only competition where we fly all three FAI schedules (preliminaries, finals and unknowns) which makes this a unique event in the calendar with a long history in the GBRCAA. Since 2018 the GBRCAA Championships have been used as a BMFA Team Selection event for FAI competitors.